Use the link above to read the full book online or download and print your copy free. James Carrell was born in Granville County, N. C., around 1787. His birthdate is estimated from information contained in the 1850 Census of Giles County, Tenn. In later years his daughter, Mary Carrell Owen, answered the 1880 Census for Giles County that her father was born in North Carolina. On March 14, 1813, in Williamson County, Tenn., a James Carrell was brought before the court because he beat and wounded John Roberts. Robert Sammons helped him. James put up bail, but Sammons spent 52 days in jail and was ordered to pay a $13.50 fine. On Sept. 26, 1813, James Carrell enlisted for service in the War of 1812. His affidavit for 160 acres of Bounty Land stated that he was a substitute for William J. Mayberry, mustering out at Fayetteville, Tenn. He was a member of 2nd Regiment Tennessee Volunteer Infantry, serving under the command of Col. William Pillow. His captain was C.E. McEwen, who later swore upon affidavit that Carrell served under his command. The regiment to which Carrell belonged was composed of about 400 men who participated in Jackson's first campaign into Creek territory along with the regiment under Col. Bradley. Both these regiments fought at the Battle of Talladega on Nov. 9, 1813, where Col. Pillow was wounded. 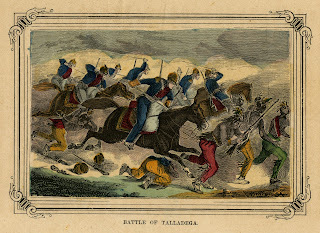 An anecdote concerning Pillow at Talladega claimed that Jackson ordered the colonel to fall back once the Creeks attacked, but Pillow refused on the grounds that he would not let his wounded men be "scalped by the demons." Lt. Col. William Martin, who took over the regiment after Pillow was wounded at Talladega, was later at the center of a dispute with Andrew Jackson over the enlistment terms of the regiment. Basil Berry, who served with Carrell, swore in an affidavit that Carrell was at the Battle of Talladega with him, after which time Carrell was promoted to Major, though there is no official record of this promotion. The line of march would have taken these men from Fayetteville to Huntsville and on to Fort Strother, where the regiment was stationed after the Battle of Talladega. Less than 15 miles from Fort Strother lay the Creek village of Tallushatchee, where a large body of Red Sticks had assembled. Jackson ordered Gen. John Coffee, along with a thousand mounted men, to destroy the town. On the morning of Nov. 3, 1813, Coffee approached the village and divided his detachment into two columns: the right composed of cavalry under Col. John Alcorn and the left under the command of Col. Newton Cannon. The columns encircled the town and the companies of Capt. Eli Hammond and Lt. James Patterson went inside the circle to draw the Creeks into the open. The ruse worked. The Creek warriors charged the right column of Coffee’s brigade, only to retreat to their village where they were forced to make a desperate stand. Coffee’s army overpowered the Creeks and quickly eliminated them. Coffee commented that "the enemy fought with savage fury, and met death with all its horrors, without shrinking or complaining: no one asked to be spared, but fought as long as they could stand or sit." One of the Tennessee soldiers, the legendary David Crockett, simply said: "We shot them like dogs." The carnage ended in about thirty minutes. At least 200 Creek warriors (and some women) lay dead, and nearly 100 prisoners, mostly women and children, were taken. American losses amounted to five killed and about 40 wounded. Shortly after Coffee’s detachment returned to Fort Strother, Jackson received a plea for help from a tribe of allied Creeks at Talladega, who were besieged by a contingency of Red Sticks. Jackson responded to the call by mobilizing an army of 1,200 infantry and 800 cavalry and set out for the Creek fort at Talladega, arriving there in the early morning of Nov. 9. Using the same tactics that had worked at Tallushatchee, Jackson surrounded the town with a brigade of militia under General Isaac Roberts on the left and a brigade of volunteers led by General William Hall on the right. A cavalry detachment, under Colonel Robert Dyer, was held in reserve and an advance unit, led by Colonel William Carroll, was sent in to lure the Red Sticks out into the open. When the Creeks attacked the section of the line held by Roberts’ brigade, the militia retreated allowing hundreds of warriors to escape. The gap was quickly filled by Dyer’s reserves and Roberts’ men soon regained their position. Within 15 minutes the battle was over. At least 300 Creeks perished on the battlefield while American losses amounted to 15 killed and 86 wounded. Jackson marched his troops back to Fort Strother to attend to his wounded and obtain desperately needed supplies. Prior to the Battle of Talladega, Jackson had expected to rendezvous with an army from East Tennessee under the command of Major Gen. John Cocke. However, jealousy and rivalry between the two divisions of the state prevented the hoped-for junction of the two forces. Cocke, in need of supplies for his own army, felt that joining Jackson would only make the supply situation worse (supply problems plagued the Tennesseans throughout the Creek War). Cocke insisted that his army seek its own "glories in the field." James was honorably discharged on Jan. 15, 1814, at Franklin, Tenn. The best description for what I do would be “ancestor investigation.” I love it. Somehow I had the impression for the first 48 years of my life that I could not put the pieces of my personal history together without professional help – which I had received free of charge over the years from two great genealogists, Frank Tate and Elizabeth White. I can only hope to become half the researchers they were, so this blog post is dedicated to the memory of these beloved mentors. If you are interested in your family history – and let’s face it, you either are or you aren’t – but you do not know where to begin, these articles are for you. I will attempt to share some of what I have learned about conducting research and utilizing historical resources. However, please heed this warning: ancestor investigation is addicting. You will know you have a problem when you begin to think more about your deceased relatives than your living ones. Or when you can’t wait to finish everything else so you can hit the research books or websites. You miss these people whose barely legible names are scrawled in some marriage bond or Census record or deed. Maps of the places they once lived mesmerize you as your imagination takes you over the paths and streams and hills they must have traveled. You imagine their anticipation at embarking on a new life when their name appears on a ship’s passenger list. You shed real tears when you read their will or touch their tombstone. To genealogists those people whose names you have scarcely heard or whose stern faces you’ve glimpsed in old portraits become increasingly alive. You are connected to them – and not just by DNA. Their story, whether decades or centuries old, is part of your story. The totality of your family’s history is intertwined with the history of your community, state, continent and of the world itself. What is most amazing, through diligent ancestor investigation, these connections are made and our limited years on this earth fit into the infinite expanse of time. So how does one begin? Certainly not at the beginning, since it is very difficult to find where that is! First, buy yourself a sturdy notebook and some pencils with erasers. Yes, I know you will be using a computer for much of the process, but nothing takes the place of a notebook that can be carried anywhere…and should be. Do not worry yet about charts or programs. Nothing is as important as collecting the facts. Begin with yourself. You probably know much more than you think you do. Write your name at the top of a page. Skip two or three pages, then write your mother’s name. Move on to your father, each grandparent, great grandparent and so on, skipping a few pages between each person. Under each name, start recording facts, such as birth, marriage, education, religion, military service, employment, death, burial, full names and anything else pertinent to that individual with as many dates and details as possible. If the person is still living, make a list of questions you need to have answered. This is where you will learn the names and/or nicknames of the older generations (make each one a page), family anecdotes, physical descriptions and other important information not contained in official records. Each person’s pages should be filled in as details emerge. These will be the basis for your research. Bear in mind that family members do not always know exact details about their elders any more than your children know or could recite all the facts about you. Memories are relative – no pun intended. Simply by urging a person to relate something to their own life or memories, you can estimate dates that could assist verification of facts that your parent, grandparent, older siblings or cousins, aunts or uncles or even longtime family friends are sharing. For example, your mother may not know when her great grandfather died, but she may remember that it was when she was in a certain grade of school, which can narrow down years in which to search for documents like wills, probate records or land sales. Never pass up the chance to copy or make a good, clear high-resolution photograph or scan of any document, artifact, heirloom or photo offered. Sometimes letters, military papers, lawsuits, estate settlements and other fact-filled documents have been around so long, people have forgotten they exist. Ask if there is anything physical associated with the family history. This could be the last chance you will ever have to get a picture of your grandfather’s pistols or your grandmother’s wedding gown. Practical Strategies for Using Resources. There are many websites devoted to helping find ancestors, and most of them require a membership fee to receive their full access, with additional charges for non-U.S. collections. Some claim to offer billions of records, but these usually include other people’s family trees they have uploaded. Other people’s trees are NOT records, and a serious genealogist must resist the temptation to accept anything as fact that they have not themselves confirmed. I subscribe to two services: Ancestry.com (U.S. only) and Fold3.com. The cost is approximately $200 per year, but the availability of downloadable scans of original documents saves me thousands each year in travel, copying, postage or phone calls. That said, there are numerous free resources online and in our communities. A short list of places to get started is included as a sidebar to this article. These include libraries, county archives and special research rooms where you may search at no cost collections of bound census records, Civil War service and pension records, newspapers, marriage books, deeds, wills, estate settlements, probate and other court documents, cemetery records, death certificates, maps, old photos and numerous other data collections. If at all possible, use only original records – not transcriptions. Because of the difficulty in transcribing names, the error factor increases appreciably when using transcriptions. This is true of all documents, and every effort should be made to obtain a copy of the original document to use as a source for your data. Never forget to record the source of your research information. Unsourced information is virtually useless in the end. Before you begin collecting facts, you may want to download certain forms to help you remain organized. One site, familytreemagazine.com/info/censusforms, offers free worksheets for use with the U.S. Census. Each is designed for a specific census year since the various Census records throughout the decades collected different data. To get a better idea of how to use the Census and other public records, download this thorough guide from the National Archives: tinyurl.com/archivedrecords. The Census is always a great place to start and can give you an immediate sense of accomplishment. The Census has been taken since 1790. Unfortunately, most of the 1790 and 1810 records no longer exist. Neither do the 1890 records. This is a source of eternal frustration to researchers, and as you become more experienced, you will see why this loss is lamented. The most recent records available are from 1940, which were released only last year in keeping with Census records remaining confidential for 72 years. Hard as it is to do, you must choose a family “line” to get started. For the novice, I recommend selecting the family line closest to your home. This will enable you to use at no charge the materials provided by your local research facility or your state archives. Try first by searching for your parents, grandparents or even great-grandparents in the 1940 Census, which is free online at 1940census.archives.gov, and includes easy-to-use instructions. When you find the records, download the .pdf copy of that record for your file. Next, you should attempt to find your ancestors in the 1930 Census and for each year prior as far back as you can go. You will find that your trail leads you through not only your parents and grandparents, but also to your gg-grandparents and if fortunate, your ggg-grandparents or beyond. There are many research records available online at no cost to researchers. One of my favorites is www.familysearch.org. The site contains billions of names across hundreds of collections—including birth, marriage, death, probate, land, military and more. I usually stick with just the official documents and records when conducting research online. As I have pointed out before, it is detrimental to your research to accept other people’s family trees published on the internet as accurate unless they provide a verifiable source. In my communications with researchers across the country, I have been mislead into believing that a person had a revealing family history that could close gaps for me in my research only to find that they had merely copied another person’s research, usually unsourced, and accepted it as correct. Everyone apparently wants to be descended from royalty, the rich, the famous or the infamous, so may of these “family histories” published online tempt novice or lazy investigators into latching on without any logical verification. DO NOT fall prey to this. Our ancestors were heroes in their own rights. For example it can be very exciting to find proof that an ancestor was an early settler and survivor to an area were Indian treaties had recently been signed. Perhaps your ancestor fought in the American Revolution, the War of 1812, the Civil War or some other conflict. Finding their enlistment records, payments for service, pension application files or prisoner of war records brings their struggles to life and makes you thankful that you even exist. Using the tools and advice I provided here along with this information should set you on a successful course toward discovering your own glorious family history. Now, let’s look at www.familysearch.org and how to get the most from it. Even though it is free, you must create an account so you will be able to download .pdf copies of original scanned records, which of course you want to do. To keep yourself organized, I suggest you create file folders with the names of each of the families you are researching so you can save the downloads to those folders immediately. Rename the downloaded file in a way that will save time later. For example: 1850.census.benjamin.johnson. With a file name like that, you can search for it by date, type of record, first name or last name. FamilySearch’s collection includes materials from all over the world, but for beginners, it is best to conquer your local, state or national records first. 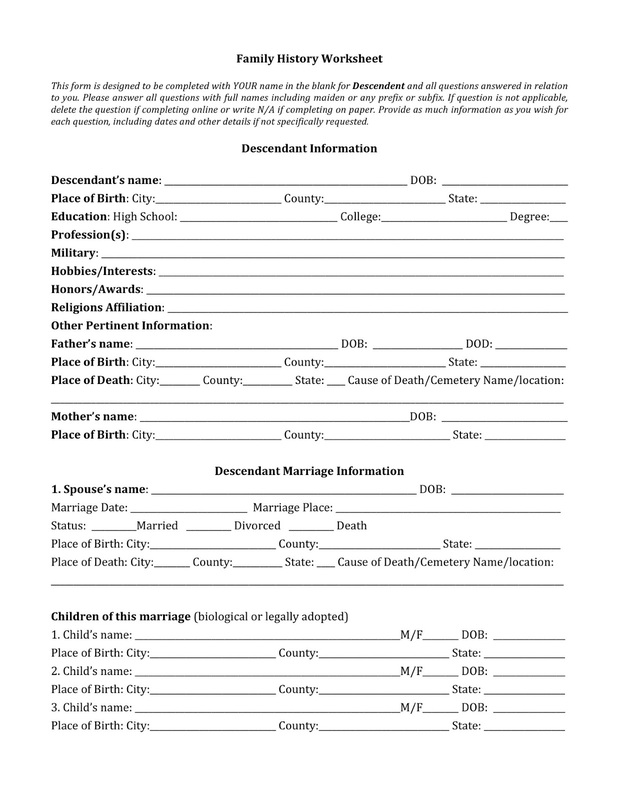 Among the records specific to Tennessee offered by FamilySearch for free are Tennessee Marriages, 1796-1950, Tennessee Death Records, 1914-1955; Tennessee Civil War Service Records of Confederate and Union Soldiers, 1861-1865; Tennessee Confederate Pension Applications, Soldiers and Widows, 1891-1965; Tennessee State Marriage Index, 1780-2002; and Tennessee Probate Court Books and Files, 1795-1927. These collections have been scanned, so you will be able to read the originals. Warning: handwriting is often a challenge to read. Be very careful when transcribing. Remember that MOST people could not read or write, let alone spell – sometimes even their own name. Even a name as simple as Johnson is often misspelled as Jonson or Johnston, sometimes in the same document. Another of my family names is Owen. People in the same immediate family are recorded in various documents as Owens and sometimes Owings or Owins. My Carvell ancestors show up in local records as Carvill, Carville and Carvel. The records created by census takers, court officers and others responsible for recording names are only as good as the person who created them. Sometimes they guessed at spelling. If you are not finding records using the spelling you believe is correct, think like a person who could not spell. I finally found a record for George W. Joines by spelling the last name like my grandfather said it, “Jines.” Yep, there was the whole family in the 1870 Census Record, listed under the name Jines. The recent addition of Tennessee Probate Court Books and Files, 1795-1927 to FamilySearch has solved many genealogical mysteries for me and my researcher friends and family. Probate records from every state are scanned and arranged by county. I have downloaded original document copies from the 1700s in Virginia and North Carolina such as wills, estate settlements, inventories of the personal property of the deceased and records from estate sales. Sometimes seeing who bought items can be of great help. For example, I do not have a document that definitively proves that George Joines is the son of Thomas and Julie Ann Joines, but when Julie Ann died, George Joines bought the family Bible at the estate sale. He also named a daughter Julie Ann and a son Thomas. Whose son does he appear to be? Using the county probate records on FamilySearch requires extreme patience. They are not searchable, so after you choose the state, county and specific record, you must refer to the original index usually contained in the first 26 pages of the book. I keep a notebook beside me when doing this so I can write down the page number of anything I may want to investigate. I actually read each name on each of the alphabetical index pages, even if I may not find an ancestral name of that letter. Since it takes a while to read through anyway, I make notes on other last names that catch my attention, either because someone I know is searching that name or I know it to have been in some way associated with my family. Sometimes the will or estate record of a known neighbor contains a clue important to my research. For example, I am not directly descended from the Pillow family of Maury County, but we share a common ancestor, Gideon Johnson of Virginia and North Carolina. Therefore, various official records regarding the Pillow family have shed light on my Johnson family and in some cases, mentioned my direct ancestor. If you would like to share with me your successes or if you have questions about your research, please contact me at dejavu159@gmail.com. 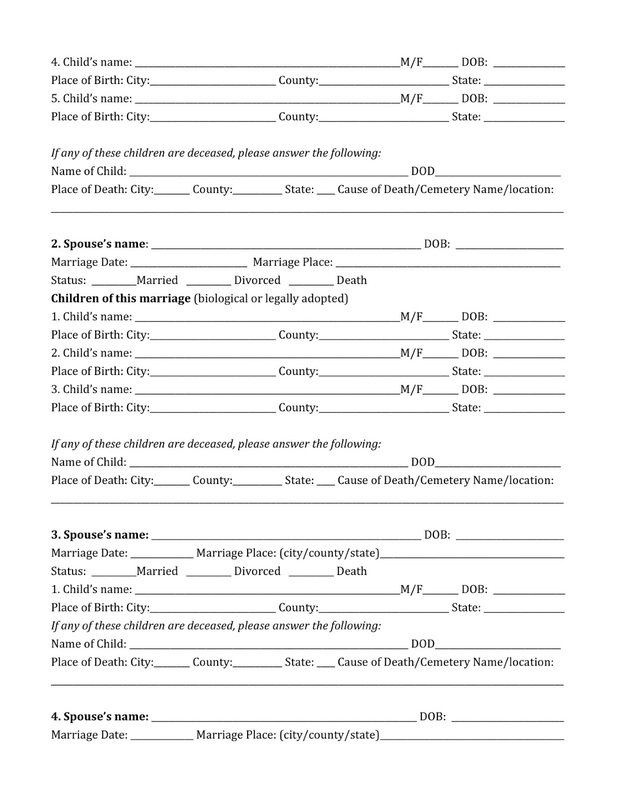 Click on the family history worksheets one page at a time to make each one full-size. 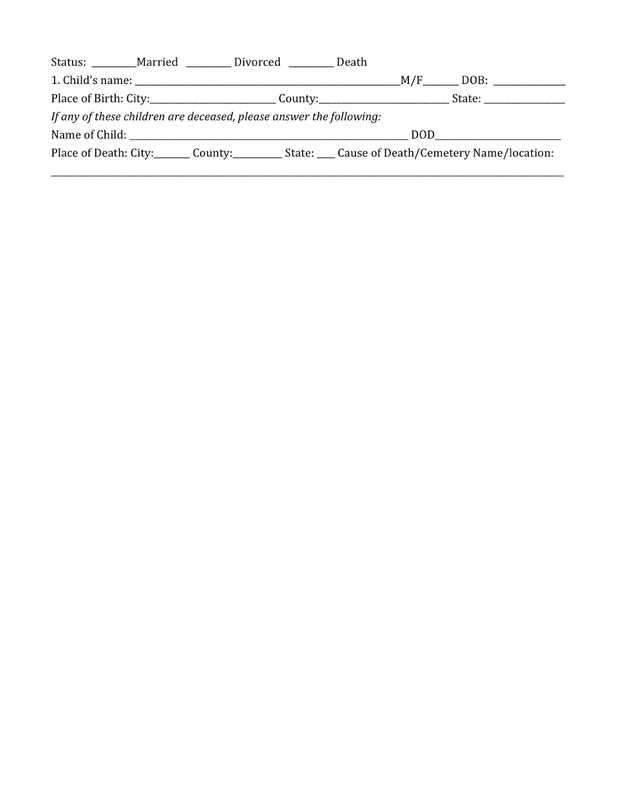 Print the sheet to use as a guide for your questioning as you begin your Ancestry Investigation research. Five years in the making, the publication, released in December 2011, is the collaborative effort of 50 contributors, crossing 13 generations and containing the names of more than 8,000 of Willard’s descendants. However, Nichols assures that the book is far more than traditional genealogical offerings, calling it “a true-to-life adventure,” supported by more than 200 pages of vintage photographs and hundreds of documents, letters, bible records, personal stories and newspaper accounts. The History of the Beverly Willard Family of Virginia and Tennessee is being presented on DVD in two volumes in the .pdf format readable by all computers and mobile devices. It may be purchased through Dec. 1 at the pre-publication price of $25 (no shipping/handling) or after at $35 per copy. Orders are filled upon receipt at 180 Rose Hill Cemetery Road, Pulaski, Tenn. 38478. Margaret Pellegrini, 89, who played the flowerpot Munchkin in the 1939 movie, died Wednesday, a spokesman for the Munchkins told news outlets, including CNN. Spokesman Ted Bulthaup said that Pellegrini, one of the Sleepy Head kids in the film, suffered a stroke at her Phoeniz area home on Monday. Pellegrini was one of three surviving Munchkins. Her death leaves Lollipop Kid Jerry Maren, 93, and Ruth Duccini, 95, to carry on the Munchkin legacy. According to a 2009 article in The Arizona Republic, Pellegrini was 15 when she played one of the 124 Munchkins in the movie. She said they didn’t know what the movie was about until they saw it on the big screen, when she screamed the first time she saw herself. “They thought someone was dying,” she said. She said that people asked her all kinds of questions about being in the movie, but the one she got asked the most was this: Did you meet Judy Garland? She also debunked the urban legend that a Munchkin died on the set during filming. 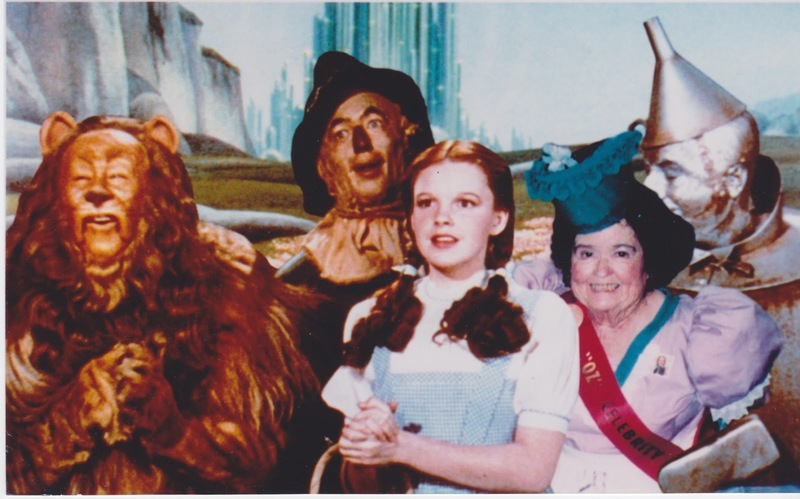 In the book, "The Making of The Wizard of Oz," by Aljean Harmetz, Pellegrini said that what she remembered most about the movie was "the feeling of specialness. Someone was always there to brush my hair or fix my costume. For Christmas, Judy Garland gave all us little ones a big box of candy. We sat on the Yellow Brick Road and passed the box around. She also gave us autographed pictures. I still have mine." Pellegrini was a frequent participant at Oz festivities wearing a costume similar to the one she wore in the movie. She was a regular at the annual OZtoberfest at the Oz Museum in Wamego, Kan. Museum officials planned to show a new video interview with Pellegrini at this year's festival, Sept. 27-29. In 2007 she attended the presentation of a star given the surviving Munchkins on the Hollywood Walk of Fame. People placed flowers on that star Wednesday. Blogger’s Note: RIP Margaret Pellegrini. This lady is my cousin. She and my Granddaddy Johnson were first cousins. I spoke to her in 2009 about our family history in hopes that she could shed light on some of the questions I had about the Williams side. 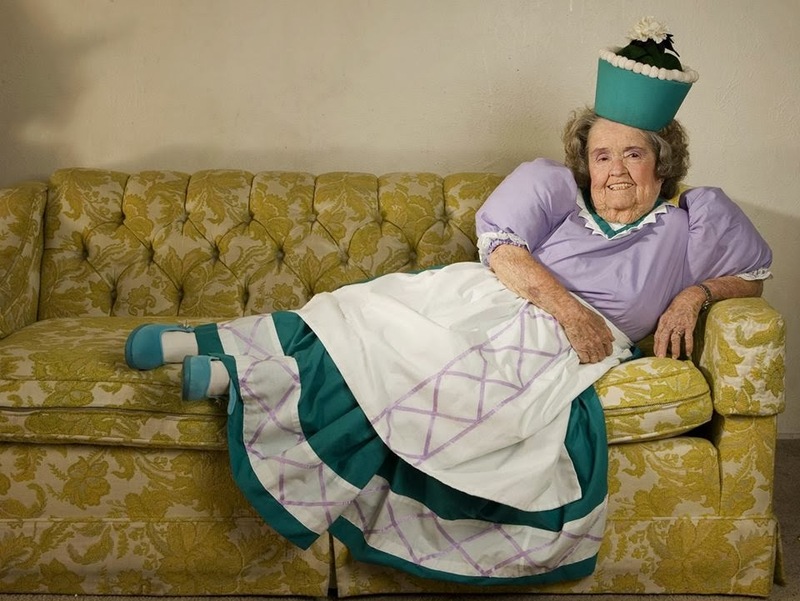 She was a sweet lady and so proud of her Munchkin heritage. She told me the story of how she became a Munchkin, which I will write from my notes and publish on here as soon as possible. I had hoped to get the history I was writing about our family to her before she passed. I know she was lonely. Her husband and children were dead, and she expressed to me how tired she was. For our family, here is how we were connected. Leoma Williams and Archie Williams were brother and sister. Leoma married Ed Johnson, and they are the parents of Benjamin Monroe Johnson Sr. Archie married a Marshall, and Margaret was their child. This makes Monroe and Margaret first cousins. Monroe's children are Margaret's first cousins once removed. Monroe's grandchildren are first cousins twice removed...and on down the line. In the same year Giles County was created, 1809, newly elected President James Madison and his style setting wife, Dolly, moved into the White House. Tennessee was a mere child of thirteen, and the United States had been a nation for thirty-three years. In many respects, though, Great Britain had never recognized American independence and continued to treat the young nation as a British colony. By 1811 when Pulaski was newly established, America's relationship with England had deteriorated to the point Congress declared war, listing Britain’s hostile actions as justification. Under the Orders of Council, American ships had been forced to pass through England despite their destination, curbing trade with other European countries. U.S. citizens sailing under the American flag had been forcibly seized and impressed into British navel service. U. S. commerce was being plundered under a pretended blockade. Worst of all, at least to Southerners, the English were encouraging Indian warfare in recently settled areas, creating an atmosphere of fear and danger for pioneer families. Perhaps it was this situation, or expansionist urges, or a simple desire to protect the homes they had struggled to build out of wilderness, that evoked intense patriotic fervor among pioneers. Though poorly equipped and ill trained, the South readied its militia units to fight both the Indians and the British. Paradoxically, the New England coastal states which had suffered economically from British hostilities, exhibited great sympathy for the enemy, sending supplies, money, even beef cows for food, to Britain’s offshore fleet and her armies in Canada. In 1813 the Embargo Act closed ports in New England, ending trade with the British. Early Giles County historian, McCallum, related a story in which a local woman, like most settlers, patriotically refused to purchase imported goods. In the usual manner, she made coffee out of dried okra, and served it to a breakfast guest from the Northeast. The man commented that the coffee smelled very strong of the embargo. His hostess quickly replied that it smelled equally as strong of liberty. With such sentiments, there is little wonder that Tennessee earned its nickname "The Volunteer State" during this period. A large number of Giles Countians served in the War of 1812, and many were alongside Andrew Jackson and Sam Houston in at the Battle of Horseshoe Bend in Alabama during the Creek Indian Wars, which were a part of the War of 1812. Some later served with Jackson in the Battle of New Orleans. Perhaps the most outstanding of the Giles County soldiers was Thomas Kennedy Gordon, who had been a captain in the militia at 18 and lieutenant colonel commandant of the Giles County Regiment of the Tennessee Militia at 22. He volunteered for the Creek Wars taking many locals with him. As rations and supplies dwindled, and most men were ill and wanted to head home, Gen. Jackson, who was also sick, declared, "As long as one man remains, I'll stay here and fight." Col. Gordon responded, "General, I'll stay, will die with you." Jackson and his men went on to defeat the Creeks, and the two men became lifelong friends. As President, Jackson mailed his wealthy planter friend and Buford Station resident, a letter addressed simply "the Colonel at Mont Gordon, Nashville." It arrived. Many Giles County Gordons are descended from the Colonel. Another Giles Countian who distinguished himself, though rather dubiously, was Lt. William M. Kerley, who had come to the county with Tyree Rodes and lived on his land at Clifton Place. Among the first troops called for service, Kerley and other soldiers misunderstood the terms of their enlistment and planned to return home shortly after Horseshoe Bend, at which time Gen. Jackson demanded the return of Kerley's sword. When the lieutenant refused, Jackson threatened him with a pistol, which, according to Charles Clayton Abernathy, Jackson would certainly have used had yet another Giles Countian, Dr. Gilbert Taylor, not taken the weapon from Kerley an returned it to Jackson. Jackson later gave the sword back when Kerley explained he needed it as protection to lead his men home. Jackson said Kerley was too brave a man to punish and pardoned him. Kerley's life was one of many saved by Dr. Gilbert Taylor, a distinguished surgeon trained in Philadelphia, who arrived in Pulaski in 1811. He volunteered for the Creek Wars and was surgeon of his regiment and on Jackson's own medical staff. At his own request, he acted with the artillery at Emuckfaw and Enotochopie. He bought an large gun, five feet long and of an unusual caliber, carrying nearly 40 buckshot at a load. At Emuckfaw he took a good position, watched for the flash of Indian guns, and fired at the flash. The easily recognizable blast of his gun prompted his comrades to cry out, "There's Taylor's artillery!" At Enotochopie he was one of twenty-five who volunteered for a dangerous defense mission and one of the six who survived it. He became a Methodist minister in 1819 and served his community until his death in 1870. James Patterson, a civilian who had been illegally held captive for three years during the Mexican War for Independence, was a member of Capt. John Gordon's company of spies during the Creek Wars, with a squad of twenty men under him in special service to Gen. Jackson. Although he carried a six-foot- long bear gun, he was nearly killed by a Creek Indian with a tomahawk, who chased him, striking him in the back several times. Patterson was saved by his thick buckskin shirt, the only uniform he and most of his fellow Giles County soldiers ever knew. Outstanding Giles Countian Charles Clayton Abernathy in his "Recollections" recounted his return home from the Creek Wars. He and his friend, a Gen. McCafferty, started from Ft. Strother, during a rain storm with only one horse and without provisions. The storm became a flood, preventing building of a fire and forcing the men to walk in waist deep water for many miles and to finally abandon the horse. Constant walking in water and crudely made shoes rendered Abernathy's feet so sore he was unable to walk. Outside Huntsville, a compassionate traveler en route to Maury County offered Abernathy his horse, thus bringing him safely home. Abernathy went on to read law, become judge advocate of the military courts, entry taker in the land office, county pension agent, first Clerk and Master of the county and first Circuit Court Clerk. A fierce Democrat and a devout Methodist, he married twice fathering 18 children, and many Abernathys in Middle Tennessee are his descendants. A number of Giles Countians are descendants of soldiers of the War of 1812. Below is a list of last names of known soldiers. Research assistants in the Giles County Historical Society Genealogy Room can provide help in tracing family histories. The Society of the War of 1812, a national organization, extends membership to all descendants of that war's soldiers. Rambo, Maxwell, Madry, Warren, Johnston, Hogan, Kiddy, Hiles, Kelly, Henry Dugger, Hamlet, Gordon, McCandliss, Hazelwood, Barker, Jackson, Clark, White, Creasy, Dodson, Smith, Kidwell, Davis, Chapman, Estis, Emerson, Hichmans, Richie, Button, Dodson, Evans, Abernathy, Bass, Buford, Caruthers, Clack, Cleveland, Everly, Flournoy, Hurlston, McDonald, Morris, Phillips, Kirley, Patterson, Rose, Taylor, Kimbrough, Wilcockson, Carrell, Joines, Coleman Hardy. For more information visit www.nps.gov/hobe/. Be warned that the site does not list our Giles County soldiers.